UK, 2006, 95 minutes, Colour. Ant Mc Partlin, Declan Donnelly, Bill Pullman, Goetz Otto, Morwenna Banks, Omid Djalili, Harry Dean Stanton, John Shrapnel, Jimmy Carr, David Threlfall, Shane Rimmer. If you are besotted by UFOs, Aliens and believe firmly in Roswell, don’t see this film – unless you are eager to bypass the evidence and construct a conspiracy theory about what the American government did and didn’t do there and what they want and don’t want us to know. Not being a UFO addict, I missed the alien autopsy film of 1995, purporting to be the lost film of an autopsy of one of the Roswell aliens. Apparently it was shown to mass audiences all around the world. Now the true (“true”) story is revealed. A local London barrow conman who specialised in pirated tapes and his friend who worked as an accountant in a biscuit factory, sought out memorabilia of celebrities life Elvis, bought them and re-sold them. When they get their hands on the Roswell footage, they find it is corroded and faded. What else can they do but stage their own amateur moviemaking with family, friends and neighbours and pass it off as the real thing. A huge hit. Now they tell their story. “They” are Ant and Dec, popular entertainers on British television, two interchangeable 30-somethings (well, one is tall and the other isn’t) who have a mass UK following. Whether they have a career in movies is an open question. It is all lightly amusing, although Bill Pullman and Harry Dean Stanton look as if they are taking the project far more seriously than the locals. 1.The popularity on British television of Ant and Dec? Their TV persona? Inseparable? Cheerful? Their transition to feature films? Successful? 2.The very British setting: the present, the offices and film studios? 1995, lifestyle, London markets, video piracy? The transition to the United States, Ohio? The south? The re-creation of Alien Autopsy? The extract from the original film of 1995? Musical score? 3.The characters of Gary and Ray, their friendship, Gary and his bravado, the market, the videos? The contrast with Ray, the biscuit factory, his expecting advancement, his being consulted, about others being advanced? His clash with the boss, leaving? Gary selling his car? The arguments, the decision to go to America? Gary and his living with his grandmother, dependent on her? The contrast with Ray’s apartment? The travel to America? 4.The seeking out of Elvis memorabilia, the meeting with Harvey, buying the film? Harvey, his explanation about Roswell, taking them home, showing them the film? Harvey and his drinking, his story about Roswell, the CIA giving up jurisdiction, his having the film? The sale? The return to England? 5.The contact with Laszlo Voros? His style, the gangster, henchmen? Sexual orientation? Vanity? Lending the money? His watching the film, wanting to own it, arranging for the screening? The surprise of so many people turning up? 6.Gary and Ray, their worries, their sending the film to the laboratory? Their friend Geoffrey? The news that nothing was visible? The decision – the grandmother, the cameraman, the friends from the local kebab shop? The working on the film, re-creation – and the amusement of amateur photography, special effects, wanting to make it authentically 1947? The success? The fans all turning up, their being satisfied that everything was true? 7.Voros, the money, the standover tactics – and his being murdered? By the Americans? 8.The characters of Grandma, her boyfriend, the kebab shop owners, the camera? Ordinary citizens? Their success? 9.The deals, the auctioning of the film to the television stations, interest around the world, interviews, bidding? Gary and Ray becoming celebrities? On television, being asked awkward questions? Their manner of getting out of the deal? 11.Harvey, watching the TV programs, wanting to get in touch? The news that there was some footage on the film? Their being sick of all the celebrity? Their having the money? Their deciding to bury the film? 12.Morgan Banner, the opening and closing of the film, his coming to Michael Kuhn at his office, the discussions with Gary and Ray, their telling their story? The impact on Banner – and his wanting to find the film? 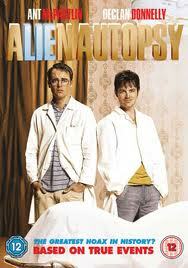 13.Alien Autopsy in 1995? The claims? The history of Roswell? Aliens and UFOs? The credibility and credulity? The reality of the film or not? The American government – and using the fake film as a smokescreen for the reality? The film showing how such footage could be made – and possibility of all kinds of fakes and conspiracies?